Cheetor is several fictional characters from various Transformers universes. "Quick action equals quick victory!" "Act with quickness, and leave the enemy no time to think!" "What can't be seen cannot be defeated!" Cheetor's original tech spec indicated he was a seasoned and confident warrior always in search of battle with the Predacons, seemingly in contrast to his youthful and impulsive portrayal in the original show. The tech spec released with his Tenth Anniversary Toy would be much more accurate to the show portrayal. Cheetor is a speed freak and has a penchant for childishness. Everyone treats him like the rookie, which is appropriate, since he has been known to make brash decisions, like risking his life in an energon storm against Optimus' orders. Cheetor seems to have an affinity for Tigatron, as he is the only other with a feline beast mode, and Cheetor will often refer to him as "Big Cat", to which Tigatron would respond by calling him "Little Cat". An unusual trait of Cheetor's is his tendency to have somewhat-prophetic dreams from time to time, such as 'foretelling' Rhinox's words at the end of an episode, Tigatron and Airazor's return, Rattrap freeing him from a web, though where this talent comes from is unknown. For the first half of the series, Cheetor idolizes Optimus Primal. He tries, with little success, to model himself after Optimus and gain his approval. He also commonly referred to Optimus as "Big Bot" (Optimus at one point calls Cheetor "little buddy"). He later begins to reject Optimus as a mentor after his second Transmetal change, which drove Cheetor to carve out his own identity within the group while still respecting Optimus as his leader; he also seemed to idolize Rhinox as well, willingly trusting Rhinox with his life to help Rhinox activate a new stasis pod. Cheetor had an unreciprocated love interest for Blackarachnia around the time of his second transformation. In pursuit of this, he conducted himself as he had in the beginning of the series with Optimus, by trying desperately to impress Blackarachnia and win her respect and admiration. He became jealous of Silverbolt for his relationship with Blackarachnia. His interest in Blackarachnia faded after she stated she was “sick of his stupid little crush”, although a later comment about how she was really something would seem to indicate that he still felt something for her. Cheetor's character was similar to that of a teenager in the early series, and that of a young adult in Beast Machines. He matures into one of the more competent and dependable Maximals outside of Optimus, becoming second-in-command and leading the team during Primal’s bouts of weakness, instability and over-reliance on the Oracle during the middle run of Beast Machines. Cheetor served as one of Primal's most trusted warriors for season one, battling against the Predacons on many occasions. However, his brashness and impulsiveness often made him a liability as well. On one notable occasion (“The Web”) Cheetor lost a valuable communications device. Determined to redeem himself in Primal's eyes, Cheetor tried to spy on Megatron's new Megacannon, but was captured by Tarantulas and had to be rescued by Rattrap before he was eaten by the spider Predacon. On another occasion, he was goaded into proving his bravery against the Predacons by Dinobot, by planting a series of spy probes. A freak accident with a bolt of lightning meant he was teleported into the Predacon base. Despite being hunted down, Cheetor managed to evade the entire Predacon team and stop the Maximal plan to destroy the Predacon base, realising that an Energon seam ran below both bases and would destroy the Axalon as well if the Predacon ship was detonated. During this period of the Beast War other senses to fight after being blinded in an explosion, and reverted to savagery after being trapped in his beast mode due to the Predacons stealing a component from the Axalon. Transmetal II Cheetor in Robot Mode. After almost inadvertently scrapping Optimus, Cheetor disobeyed orders to help Depth Charge stop Megatron using the Transmetal Driver. Shot into the active unit's overload, Cheetor slowly mutated into a feral Transmetal II werecat. Despite the need for repairs, Cheetor became somewhat fearful of the CR Chamber, as displayed in a dream sequence, mostly in fear that any attempts of repairing his structure with the underlying mutation may cause him to mutate further. Though he tried to suppress it, he transformed fully into his Transmetal II state in order to save Optimus from the Transmetal II clone of Dinobot, the two engaging in a ferocious struggle while in beast mode. Primal then helped him to gain control over his feral beast mode and Maximize at will. It is noticeable that Cheetor's voice became deeper after his change, and also became less willing to listen to Optimus, almost as though he was now an adult who no longer wished to be treated as a child, a state Rattrap referred to as "Cyber Puberty." Cheetor continued to mature and grow during the series, to the extent that he was even appointed second-in-command, Optimus recognizing that Cheetor's instincts were correct when the rest of the team made a bad decision. No longer the 'child' of the team, a role that fell to Nightscream, Cheetor was known to argue with Optimus when the team's original leader disagreed with his decisions, with Cheetor soon becoming the team's military leader while Optimus's link with the Oracle made him a spiritual figurehead. At the conclusion of the series, Cheetor apparently became leader of the Maximals, as well as becoming the new 'liaison' to the Oracle with Optimus's demise. In 2005, a toy of Cheetor was released in the Transformers: Universe line which depicted Cheetor as an Autobot named "Night Slash Cheetor" (left). Presumably he would have changed to this form if the series could have continued. He did appear in this form in a flashback in the Transformers: Cybertron series, in a final battle with Unicron's forces. Cheetor before the Beast Wars. Cheetor would appear in the BotCon Timelines tale Dawn of Futures Past, as a crewmech of the Axalon. Cheetor, Rattrap and Rhinox were members of the crew of the Maximal ship called the Axalon commanded by Optimus Primal, which chased the Predacon criminal Megatron on the stolen Predacon ship Darksyde through transwarp space after the theft of the Golden Disk artifact. Cheetor appears in the 1999 Gameboy Color video game Ketō Transformers Beast Wars: Beast Senshi Saikyō Ketteisen. This toy was later slightly remolded into Armada Cheetor, and then heavily remolded into Beast Wars Ravage and Botcon Tigatron. A Deluxe sized toy in black and gold stealth colors, featuring spring loaded swords that snapped down into his robot mode's hands. The mold went on to be repainted into Botcon CatSCAN. Cheetor 10th Anniversary toy in robot mode. Motto "Some cats roar - I just pounce." In Transformers Animated, a cheetah appears at the end of the episode "Predacons Rising", paying homage to Cheetor. With the cheetah are a gorilla, a rat and a rhinoceros - each one paying homage to Optimus Primal, Rattrap and Rhinox, respectively. 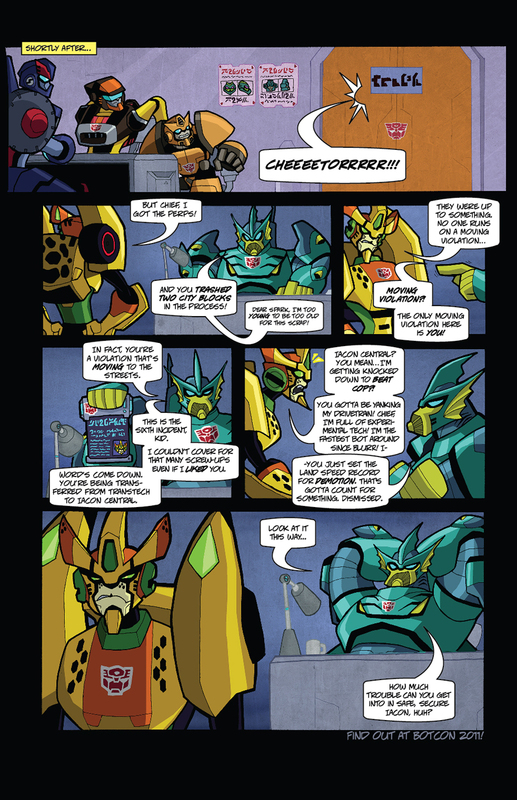 Cheetor appears in the two page prequel comic Moving Violations along side Depth Charge, Ransack, and Crumplezone. In the comic, Cheetor detains Ransack and Crumplezone for a moving violation, but causes extensive damage to the city in the process. As a result, Cheetor is demoted and reassigned to Iacon Central. Motto "Law and order are two distinct concepts." ↑ Forest Lee, Dan Khanna (April/May 2006). "Revelations Part 2". Transformers Collectors Club Magazine 1 (8): 11-16. Furman, Simon (2004). Transformers: The Ultimate Guide. DK Publishing Inc.. p. 84. ISBN 1405304618.